Grilled Citrus Chicken, Thyme for Cooking easy summer main course. Mix all ingredients for marinade well with a whisk. 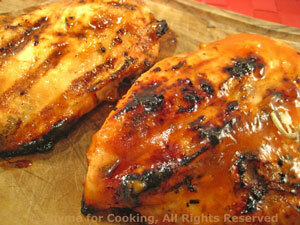 Spoon over chicken breasts and let marinate for 10 minutes or longer. Either cook 10 - 15 minutes on barbecue grill or under broiler (4 inches ) for 6 - 8 minutes a side. They should be nicely browned and juices should run clear when pierced with a knife.